Glowing Kittens Help In Fight Against AIDS Millions of cats suffer and die from feline AIDS every year. Scientists have found a way to prevent infection by injecting cat eggs with monkey genes that block HIV infection. And to help identify cats with the special genes, they added jellyfish genes to the mix. The AIDS epidemic in humans is well-known. Less known is that every year, millions of cats suffer and die from the disease. To protect cats against feline AIDS, the Mayo Clinic and colleagues in Japan devised a treatment with a peculiar side effect. They took monkey genes that block HIV infection and injected them into cat eggs. Kittens born from those eggs produced AIDS-resistant protein in the same cells that get infected, effectively shielding them from the disease. Their offspring are also immune. Read the scientific findings in depth. 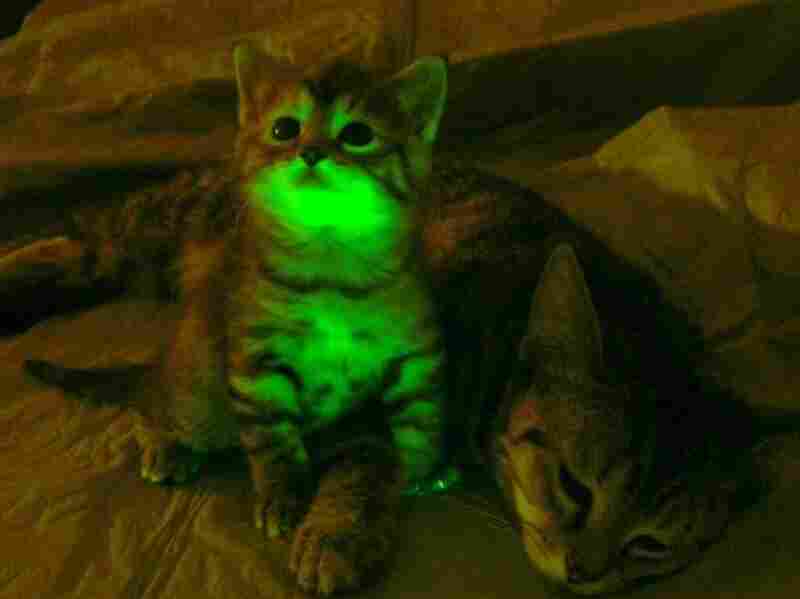 To tell the treated cats from the untreated ones, scientists added another simple ingredient to the mix: jellyfish genes, which make the modified cells glow a green color. "It allows you to tell whether the gene of interest is in the cell without having to do an invasive test," Dr. Eric Poeschla, a molecular biologist with the Mayo Clinic, tells Guy Raz, host of weekends on All Things Considered. Scientists simply turn off the lights and shine a blue light to tell which cats have the AIDS-resistant gene. The cats don't feel a thing, Poeschla says. "They're healthy and happy and they're playful." The feline treatment could help other mammals down the line. The Mayo team isn't injecting human stem cells with the monkey-jellyfish concoction, but it is watching the cats for new insights. "If they have the power to protect, then they could perhaps be used in the future in human gene therapy," Poeschla says. Unfortunately, you can't get your own glow-in-the dark kitty just yet.